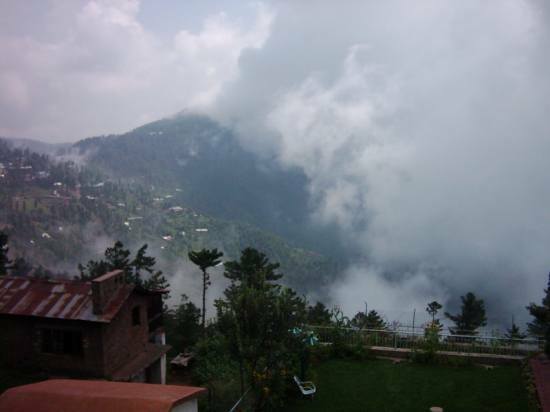 Past - Winter in Murree! A shallow western disturbance might affect the extreme upper parts of Pakistan during the middle of November that may further cause the temperature to drop in the northern areas of the country. After experiencing a post-monsoonal weather in Sindh, the province is likely witness some dry winds with misty morning in the coming few days. Temperature in northern-western Balochistan are expected to drop. *Western disturbance might affect the upper parts of the country. *Dry weather will dominate the lower parts. Western wave – Another in coming? Western disturbance 01 affected upper parts of Pakistan from October 5 to October 8 with strong gusty winds (76 km/h in Islamabad/Rawalpindi). In terms of strength this system was much stronger than the rest of waves that followed after. The rainfall was mostly light with isolated moderate falls. Western disturbance 02 affected north-western Balochistan province including from October 10 till October 11. The rain was light in intensity. Western disturbance 03 affected upper parts of Pakistan from October 13 night till October 14 morning. The winds gusted to 48 km/h in Islamabad/Rawalpindi, the rainfall was weak in intensity and isolated. Western disturbance 04 affected Northern Pakistan from October 20 till October 23 night, temperature dropped by 3°C to 4 °C, 79 km/h winds were blowing in Islamabad. Western disturbance 05 affected extreme Northern Pakistan from October 28 till November 1. Western disturbance 06, shallow in nature affected upper parts from November 2 till early November 3. Western disturbance 07 , a large westerly wave in nature affected central and upper pats from November 8 morning till November 10, also caused season’s first snowfall at some hilly areas. It’s trough also interacted with deep depression ARB 03. There had been a total of five western disturbance in the month of October while 2 in the month of November. Around November 15, a fresh western disturbance 08 would mostly affect the upper parts of Pakistan including Gilgit region. WD 09 might (15% – 45%) affect the country during late November. However no major fog-like conditions likely to develop in Punjab atleast till the coming week. As far as temperature are concerned, about 2°C to 4°C drop is expected in the night temperature of the northern areas of Pakistan, in Islamabad night temperature may hover around 11°C in coming days. In Lahore, 15°C may be the lowest in the coming weeks. About 1°C to 2°C drop is expected in these areas in the daytime. All indicating that winter is approaching! Southern Pakistan – Dry days? Stable weather is likely to stay in southern Pakistan that is southern Punjab and Sindh. Day temperatures are not being observed to change except a 1°C drop. Misty morning may return in the Sindh as dry winds will re-develop, however night temperatures may drop by 1°C to 2°C due to the expected arrival of WD 08 in few days. Dry weather is also expected in the port city. The night temperature is likely to be 22° C – 18° C while the day temperatures likely to remain around 33° C – 35 ° C. Still considered a pleasant one! ← Worst floods in 50 years continue to haunt Thailand; Death toll rises in Turkey! Its written in the article.. Always same news that lower parts like karachi will never gets rains from Western Disturbance…………….